To preserve heritage buildings, a significant reduction of their energy performance is necessary. This requires innovative approaches and sustainable solutions addressing heritage-specific characteristics. Pathfinder project ReFoMo has set the big steps by providing a better insight, an overview of measures and techniques and the actual implementation of a new-developed tool and approach. Read the full article here below or download the reports with project results. Significant reduction of the energy performance of heritage buildings is highly desirable. High energy costs and lack of comfort form bottlenecks for healthy exploitation, sustainable management and consequently safeguarding these buildings. In addition, heritage buildings will increasingly have to compete with new buildings on operating costs, as current legislation on energy efficient retrofitting does not apply to heritage buildings while energy norms for new buildings become increasingly stricter. The fact that energy efficient retrofitting of heritage buildings (EERHB) often involves several stakeholders with different interests (i.e. owner: responsible for the building and envelope; tenant: pays the energy bill) adds another complexity. In order to preserve heritage buildings, innovative approaches and sustainable solutions for EERHB addressing their specific characteristics are required. Researchers at Utrecht University recently developed a tool to evaluate energy-saving measures on cost-effectiveness and CO2-abatement based on data gathered in an energy audit. The tool provides for customized calculations addressing the unique characteristics of heritage buildings. It was successfully used in a consult to primary schools – some located in heritage buildings – in Alblasserdam, the Netherlands. The tool has significant potential for market launch. 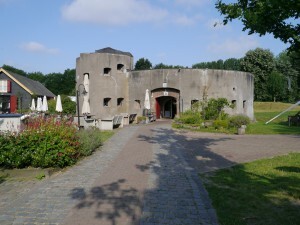 Another novelty is the development of a broad approach for the preservation of forts in the Netherlands. The Dutch foundation De Groene Grachten (Green Canals) analyzed two forts in the Utrecht region, providing an integrated sustainability plan with three scenario’s towards climate-neutral forts. This method is based on their experience with the sustainable preservation of historic canal houses in Amsterdam and could serve as a format for a comprehensive approach for forts and heritage buildings in general. 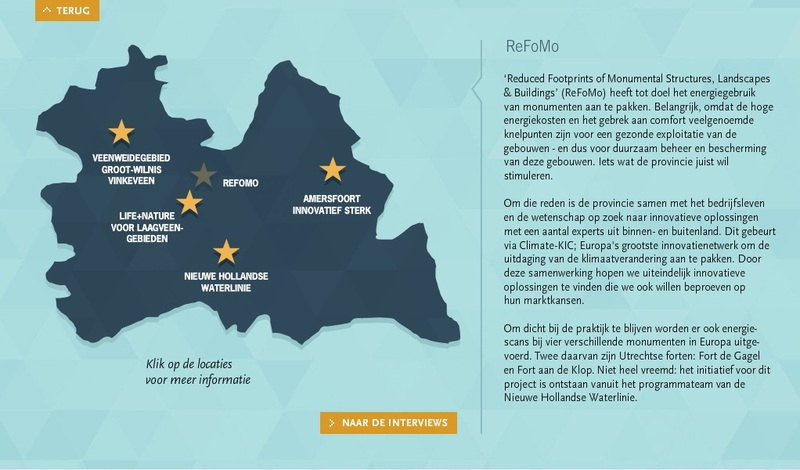 Both innovative developments are a result of the Climate-KIC Pathfinder project ReFoMo (Reduced Footprints of Monumental Structures, Landscapes and Buildings). This project focused on reducing the footprint of heritage buildings by bridging the gap between energy performance and potential energy savings. The research included a market analysis and three case studies aimed at determining the energy performance and potential measures for climate-proof refurbishments of four heritage buildings in Utrecht (fortresses from the New Dutch Waterline), Bologna (the faculty building of engineering) and Budapest (Clockhouse, Óbuda Gasworks). The case studies have provided an overview of potential measures, best practices and main barriers to overcome in the refurbishment process of the specific buildings, delivering a wider perspective on the retrofitting process. This has resulted in a better understanding of diagnostic and monitoring tools to evaluate the energy performance of heritage buildings, an overview of retrofitting techniques and practices and a better insight in the decision making factors of the actors involved . Nevertheless, there is more to learn about the governing factors that influence this transition. The bridge between current technical knowledge on retrofitting and the necessary governance arrangements to boost its implementation is still in its infancy. Successful EERHB initiatives are often not implemented at a larger scale and do not often instigate climate mitigation policy. Thus, the question here is how to go from such incremental intervention to systemic and large-scale change. ReFoMo has set big steps to answer this question. On September 30 a meeting was held about The Green Forts with different stakeholders. The meeting focused on the formulation of needed conditions for mutual learning about sustainable renovation. Read the full report: Report The Green Forts Workshop 1. In August Minusplus finished the report on the case study Óbuda Gasworks in Hungary. The Meter House in Óbuda Gasworks is one of the three European listed heritage buildings analysed on energy performance and potential energy savings in light of the Climate-KIC Pathfinder project ReFoMo. Listed monuments require preservation of among others the facades and roof-forms. Within these restrictions, Minusplus defined solutions for the Meter House Building of Óbuda Gasworks to halve the energy use and to lower CO2 volumes to one third. The report concludes that the highest energy-savings can be realized by applying roof insulation. Energy usage peaks can be reduced by realizing a multi-function space, thus expanding the time of potential use of the building. By adjusting the right air flow direction between the different inner functions, extreme demands of HVAC can be balanced to save energy. Reports on the other two case studies in the Netherlands and Italy are expected later this year. Reports will be made available on the project website: www.refomo.eu. For more information, see: http://editie03.provincieutrechtmagazine.nl/#!7-Europa. C-Fordt in Maarsseveen was the stage for the Kick-off meeting of the new project ReFoMo. Erik van Tooren, initiator of the project on behalf of the Province of Utrecht: “In the summer of last year I was at a Climate-KIC meeting and at some point I thought: why not see if we can reduce the footprints of heritage buildings like the fortresses of the New Dutch Waterline? I made some phone calls to some Climate-KIC partners if they would be interested and some were. And here we are!”. These partners have now come to C-Fordt for the kick-off of the project that will run until the end of 2015. The fortress C-Fordt is part of the New Dutch Waterline and as such a potential location for the feasibility study that will be carried out within the New Dutch Waterline. The project partners were taken around and through the fortress to see the structure and the functions it has now. Inside, Pascal van Droogenbroeck of Monumentaal, a centre for sustainable develoment and innovation, presented the plans for the fortress: to adjust and extend the building to accommodate new functions but also to experiment with various high tech and low tech solutions for the energy management of the fortress. The other two feasibility-studies were presented as well. The University of Bologna presented the building of the School of Engineering, a architectural building with a difficult energy management due to different functions and rooms in a broad range of sizes. On the other hand the historical value restricts the possibilities for adjustment and retrofitting. Two partners from Hungary, NEGOS and Minusplus Architects, presented their feasibility-study: a former gasworks building beside the Danube, in Budapest. This building is completely empty and has no current use. Development of the site is difficult due to soil contamination. Their challenge is to retrofit the building without disturbing the soil. Together with Arcadis (NL), University of Utrecht (NL) and Aidico (ES) these partners will analyse these case-studies in order to deliver innovative technical and knowledge-based solutions. The kick-off meeting was the first chance for the 7 projectpartners to meet each other and take the first steps in the Climate-KIC pathfinder projects. Within a relatively short period of one year the 4 workpackages (market analysis, feasibility studies, synthesis and overall co-ordination and exchange) will have to be carried out. As a start the three feasibility-studies were discussed during the meeting. In the coming weeks the working group will elaborate further actionson the other workpackages. The historic environment of Europe is one of its greatest assets and an effective means of reconciling the needs of citizens, economy, community, environment, and society at large. But we cannot take it for granted! Our built heritage is valuable and vulnerable and securing its benefits now and in the future demands focussed action and investment from society, the heritage sector, and above all, the public authorities. Aware of these possibilities and challenges, New Dutch Waterline proposed the AT FORT project outline to significant European fortified heritage sites who share the firm belief that preservation of these sites, coupled with their economic exploitation can only be achieved by creative, mutual thinking, building on an exchange of experiences. Partners in the AT FORT project have set the overall objective ‘to facilitate the adaptive re-use of fortified heritage sites by exploring solutions for successful approaches and methods to deal with enabling conditions and to create better frameworks for their exploitation’. The project At Fort ”Atelier European Fortresses – Powering Local Sustainable Development” is a Regional Initiative Project in the INTERREG IVC PROGRAMME. Read more about the AT FORT project or about the project results.